We have harped about how ancient Spartans bragged of rigorous discipline being instilled in their citizen armies. But there was another ‘lesser’ Greek kingdom on the northern periphery of Classical Greece that eventually managed to make its world-conquering claims that no other ‘civilized’ Greek city-state could ever boast of. We are of course talking about the ancient Macedonians, and how they conducted their legendary military campaigns around most of the known world – all under the brilliant leadership of Alexander III of Macedon (or Aléxandros ho Mégas). 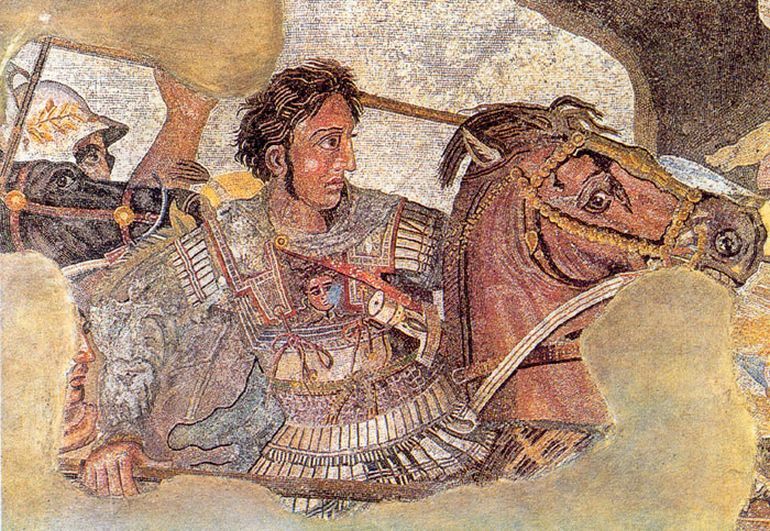 So, without further ado, let us check out ten amazing facts you probably didn’t know about Alexander the Great and his incredible army. We had previously talked about the great wars of Greece and Persia. And amid such disastrous scopes and heroic deeds, Macedonia remained a relatively unimportant backwater to the greater geo-political situation – mostly owing to its lesser strategic importance (in the north). In fact, the seemingly modest origins of the so-called Macedonian state is shrouded in obscurity, with most of the population of land being rural herdsmen in 5th century BC. In that regard, most of the southerly urbanized Greeks regarded the Macedonian inhabitants being semi-barbarous who lived on the edge of the then-known civilized world. However, by the later Peloponnesian Wars (fought between Sparta and Athens) in the later part of 5th century BC, Macedonian kings had already started undertaking public projects that improved the country’s economy. But it was the great Philip II (Alexander’s father) who started his reign from 359 BC, and made the incredible military reforms that was to transform Macedonia into a future superpower. 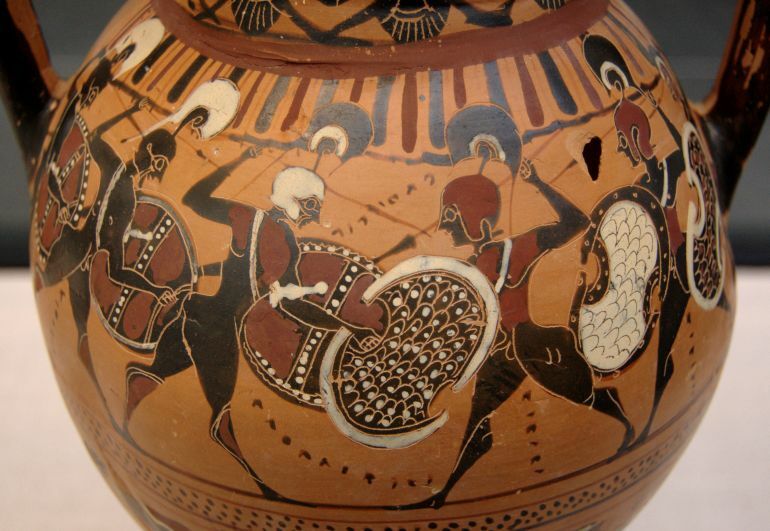 One of the most iconic features of these reforms was the evolution of the Greek hoplite into phalanx – a military stratagem that emphasized better army formation over individual prowess of a soldier (a classic tactic eventually mastered by the later Romans). And interestingly enough, Philip himself was inspired by the Theban military successes of the early 4th century, as opposed to the ‘pedigree’ of the renowned Spartans and Athenians; and even had grand plans to invade Persia (before he was assassinated). In any case, Philip’s immense contribution to the organized Macedonian state and its military had been alluded to – even during his own lifetime, when then-contemporary historian Theopompus claimed “Europe had never before produced a man such as Philip”. The phalanx as a formation demanded individual discipline and tenacity from each of its occupant soldier – with one historical anecdote from Polyaenus (a 2nd-century Macedonian author) relating to how Philip made his men march over 30 miles in a single day, with all their armaments and armor. The maintenance of such brutal military methods certainly required rigorous degrees of drilling and self-restraint. To that end, one particular scenario involved a high-ranking Tarantine cavalry officer (possibly hailing from a powerful Greek city on the west coast of Italy) who was unceremoniously stripped of his rank for just bathing in warm water. …for he did not understand the way of the Macedonians, among whom not even a woman who has just given birth bathes in warm water. And as if such drastic measures were not enough, each troop of the phalanx had to personally carry heavy provisions for at least 30 days during the campaigns (a practice that was also adopted by the later Roman legions). Furthermore, the mobility and self-sufficiency of the army was substantially increased by decreasing the number of servants (or camp followers) – which was reduced to one for every ten men. 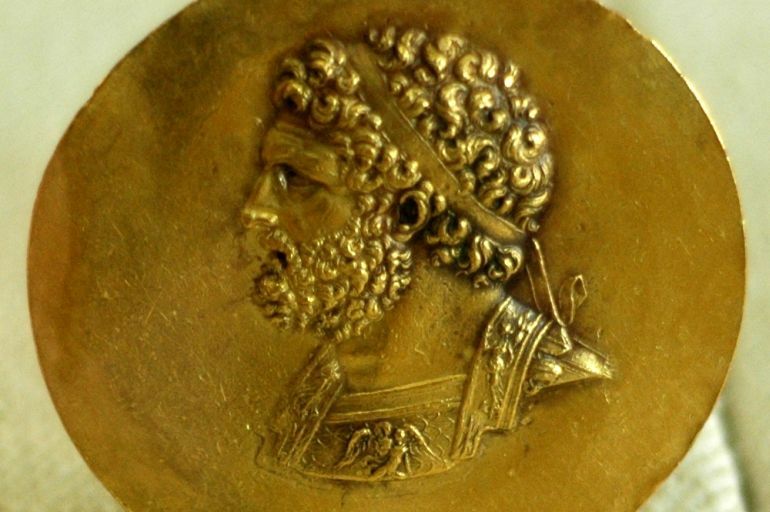 While Philip effectively drilled the Macedonians into an incredible fighting force, Alexander (the Great) endowed his inherited army with an air of majesty and pompousness. 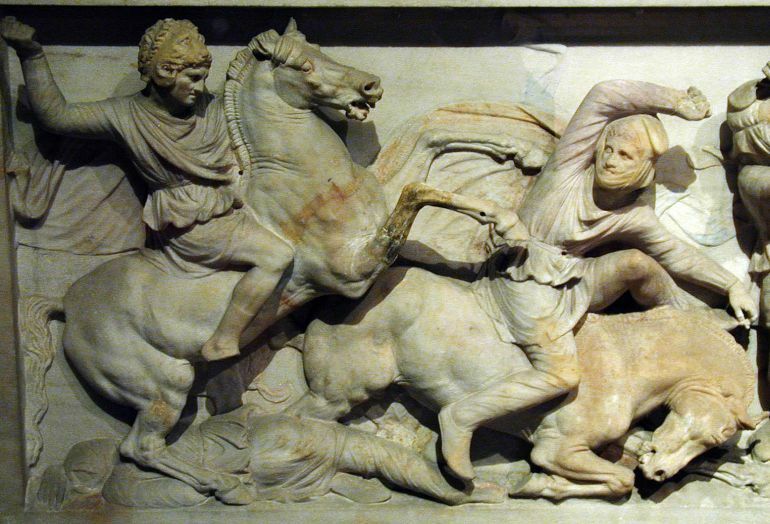 One of the conspicuous aspects of this ritzy nature was the induction of heavy shock cavalry into a primarily Greek force that was traditionally not known for its cavalry tactics. Known as hetairoi or ‘Companions’, these horsemen were generally derived from the Macedonian aristocracy and nobility. However, Alexander the Great went one step further by incorporating another core group of ‘companions’ within this already elite group. These chosen men were also referred to as personal friends of the king – according to many ancient sources. To that end, the personal companions upheld the true meaning of the word – by accompanying Alexander in various scenarios, whether it be in the thick of the battle or during recreational hunting sessions. In fact, Alexander’s fascination with his own formed military brotherhood was so great that he himself often dressed in the uniform of a Companion cavalry regiment. Now of course, such ‘normal’ officer-like attires were only worn during times of peace (and planning), and were eschewed in favor of elaborate dresses during actual battles. 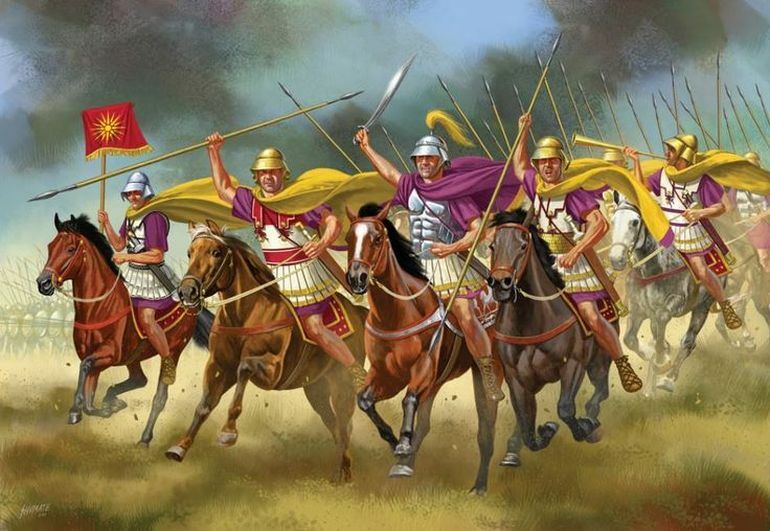 Once again, according to Polyaenus’ account of Macedonian military training, the infantrymen of phalanx were supplied with helmets (kranos), light shields (pelte), greaves (knemides) and a long pike (sarissa). So as can be gathered from this small list of items, the armor is conspicuously missing. And even after 100 years of Alexander’s death, there are accounts of his successor states’ phalanx army going without armor systems. From such literary sources, one hypothesis can be put forward – the Greek and Macedonian armies totally gave up on their heavy bronze cuirass, and instead opted for linothorax, a light armor made from glued layers of linen. Interestingly, one of the accounts of Polyaenus entail how Alexander himself armed the men who had previously fled the battlefield with a hemithorakion – a half armor that only covered the front part of the body, so that the soldiers wouldn’t turn their backs on the enemy. In any case, metallic corsets would have been unnecessary for troops in the rear-end ranks of a well-guarded phalanx – a tactical advantage that must have been welcomed by the ancient commanders who were usually short in funds and equipment. Previously in the list, we had talked about how stringent discipline was part-and-parcel of Alexander’s Macedonian army, a quality that was rarely seen in other ancient proximate cultures. An extension of this intrinsic discipline can be comprehended from their jaw-dropping feats. 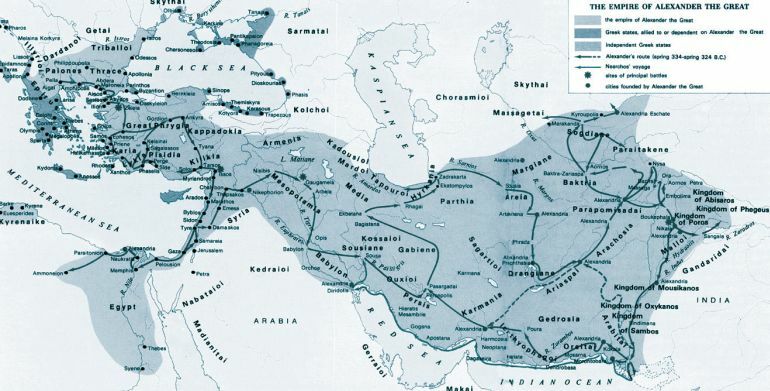 To that end, according to a calculation made by historian Theodore Ayrault Dodge, the infantrymen who had joined Alexander in 336 BC and then embarked on his Asia-bound campaign, had traveled more than 20,870 miles (or 33,400 km) by the time Alexander breathed his last in Babylon (in 323 BC). So, on an average, each of these men had covered an impressive 1,605 miles (or 2,570 km) per year! 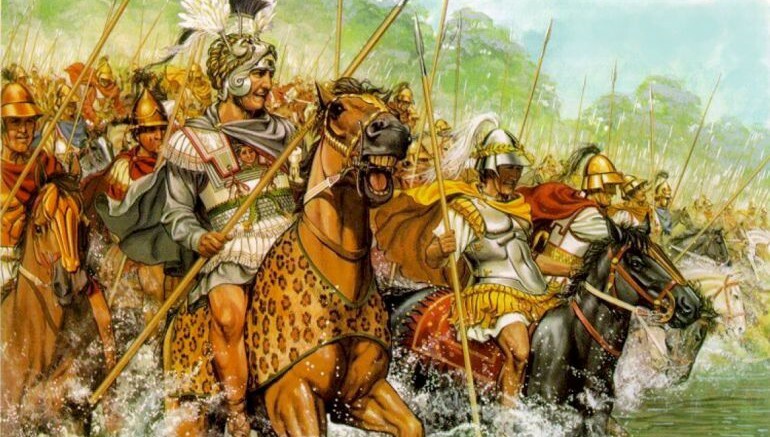 And, when translated in georgraphical terms, many of the Macedonian veterans could have claimed to cross a multitude of rivers including the Nile (in Egypt), Euphrates and Tigris (in Iraq), Oxus (in Tajikistan), Syr-Darya (in Uzbekistan) and the Indus (in Pakistan). It should also be noted that Macedonian kings most probably didn’t develop any means to actually pay their military forces. So, part of this monetary predicament was solved by allowing the soldiers to take part in plunders that usually involved despoiling the enemy cities. But even in such cases, the infantrymen were always given a far lesser portion of the ‘loot’ than their cavalry counterparts. 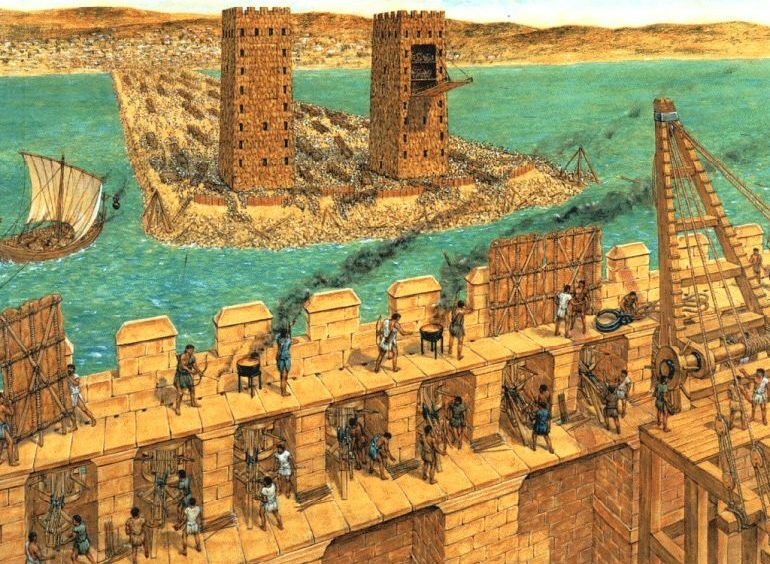 5) Alexander’s army built a makeshift pathway over seawater just to effectively siege the island-city of Tyre in 332 BC! In the grand scheme of things, the siege of Tyre might have been a lesser incident in Alexander’s brilliant (yet short) career as a conqueror. But the encounter in itself proved how Alexander was an incredibly patient strategist – which was in sharp contrast to his vicious recklessness in the battlefield (as was evident from the Macedonian cavalry wedge formations where Alexander placed himself at the forefront of the ‘spear’). In any case, Tyre was an important and nigh impenetrable commercial hub, by virtue of its ‘island’ location and huge wall defenses – that were 50 ft high in some places, according to historian Arrian! So, Alexander tried to counter the city’s fascinating defensive ambit by actually ordering his army to construct causeways (or moles) over the sea that would directly lead to the island settlement. The invading Greek forces did manage to construct (and even expand) a causeway from the rubble, rocks and even timber being salvaged from the old abandoned city of Tyre which was originally located along the coast. This causeway became the scene of a fierce encounter with Greek siege towers taking the brunt of the bold counterattack by the Tyre-based forces. However, within a few days, Alexander was able to assemble an expansive fleet of ships that ultimately caught Tyre by surprise – thus leading to the ramming and breaching of a small section of the city walls. This tactical breakthrough made Tyre unceremoniously surrender, especially after being viciously assaulted by the hardened Macedonian elite infantry (also known as hypaspists). And in the ensuing aftermath, it is said that over 6,000 inhabitants were butchered by Alexander’s forces (with 2,000 being crucified), while an additional 30,000 people were sold into slavery. Greater discipline was not the only factor that separated the Macedonian army from the other then-contemporary Greeks forces; Alexander’s phalangites also had to endure stricter disciplinary actions on account of their privileged status in the army. In that regard, cavalry officers were often punished more severely than their infantry counterparts – with actions (like flogging) being taken for minor offences ranging from bathing in warm water to inviting flute-girls into the camp. However serious offences like mutinies often resulted in death sentences, given by none other than Alexander himself. In some cases, the offenders were put to death by throwing stones and javelins at them. In other cases, more grim measures were undertaken – like throwing the prisoners into a river with tightened chains binding their bodies. However, one particular incident of punishment stands out (as mentioned by Quintus Curtius Rufus), when Alexander’s successors (just after his death) ordered some 300 mutineers to be trampled beneath the feet of elephants – and that too in front of the whole army. While there are no arguments against Alexander being one of the greatest military strategists and leaders in history, the man himself seemingly suffered from delusions of grandeur during different phases of his lifetime. One of the primary reasons for this god complex-oriented behavioral pattern might have been due the psychological effect of his mother Olympia during Alexander’s childhood. She quite openly claimed that Alexander was the son of Zeus, after supposedly dreaming that her womb was struck by thunder. This extraordinary theory was apparently even ‘proven’ to Alexander by one of the oracles of Amun at Siwa, Egypt. As a result, Alexander began to seriously identify himself as the son of the deity Zeus-Ammon – as is evident from a few ancient silver coins that depict Alexander armed with a thunderbolt. Alexander the Great also saw himself to be to rightful successor to the fabled Achaemenid emperors after his Macedonian army conquered the length and breath of ancient Persian realm. Such impressive yet influencing achievements in turn fueled Alexander to re-establish many of the Persian customs, like dressing up in the Persian royal attire and the upholding of the proskynesis. This latter mentioned practice entailed the traditional Persian act of bowing or prostrating oneself before a person of higher rank. Suffice it to say, the ‘democratic’ Greeks were averse to such a notion, and as such were alienated by many of Alexander’s megalomaniac decisions. According to Plutarch, by the age of ten, Alexander was already quite an expert in playing the lyre, debating and even reciting – all of which were sometimes performed in front of his father’s guests. In fact, both poetry and music continued to inspire Alexander even during his later life – as did the consumption of prodigious volumes of alcohol. To that end, drinking and partying came quite naturally to the young Macedonian general, especially during his extended campaigns and hunting trips. Not a shield was to be seen, not a helmet, not a spear, but along the whole march with cups and drinking-horns and flagons the soldiers kept dipping wine from huge casks and mixing-bowls and pledging one another, some as they marched along, others lying down; while pipes and flutes, stringed instruments and song, with reveling cries of women, filled every place with abundant music. 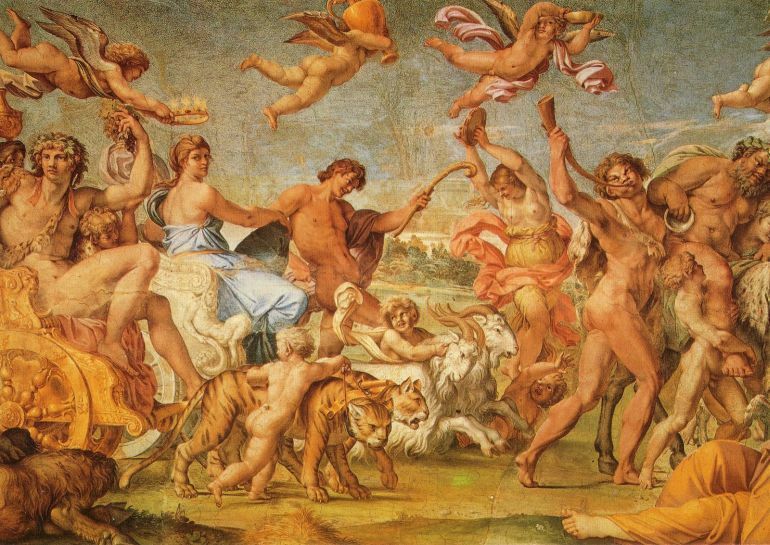 Then, upon this disordered and straggling procession there followed also the sports of bacchanalian license, as though Bacchus himself were present and conducting the revel. Moreover, when he came to the royal palace of Gedrosia, he once more gave his army time for rest and held high festival. We are told, too, that he was once viewing some contests in singing and dancing, being well heated with wine, and that his favorite, Bagoas, won the prize for song and dance, and then, all in his festal array, passed through the theater and took his seat by Alexander’s side; at sight of which the Macedonians clapped their hands and loudly bade the king kiss the victor, until at last he threw his arms about him and kissed him tenderly. 10) There is a town in Pakistan that was originally named after Alexander’s horse! Given his delusions of grandeur and tendency to deify himself, Alexander is estimated to have christened around 70 settlements (from Africa to Asia) after his own name. The thriving city of present-day Alexandria in Egypt stands as a testament to this personality-promoting pattern. However, Alexander’s obsession with his enviable achievements went beyond his own name, to also include his favorite horse – Bucephalus. Thereupon, Alexander named one of the settlements in (present) Pakistan as Alexandria Bucephalous or Bucephala, to commemorate his beloved horse who was mortally wounded in the hard-won Battle of the Hydaspes in 326 BC. As if often the case, historians are still not sure of the exact location of this settlement – with some hypothesizing its location to be around the river Jhelum, and some conjecturing its location to be along a road that connected Taxila to the Jhelum (in the latter case, the townsfolk of Phalia sometimes claim their settlement’s original name to be Bucephala). 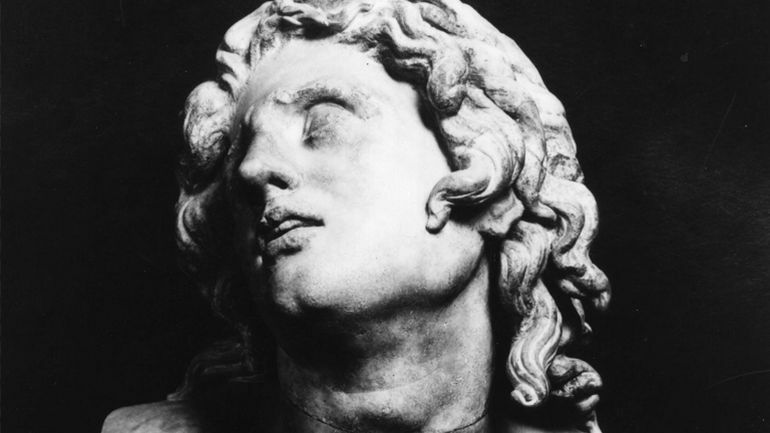 Most accounts of Alexander portray him as having a fair skin that turned ruddy due to extensive military campaigning during most of his later life. He also had a clean-shaven face (thus making him stand out from the usually bearded Macedonians), and probably possessed a rather short and stocky body, with a slightly twisted neck and a harsh voice. However, Greek historian Arrian added another fascinating anecdote by saying that Alexander had “one eye dark as the night and one blue as the sky.” Later historians (namely Peter Green) have agreed upon this observation, thus suggesting that Alexander might have had a condition known as heterochromia iridum. And, added to all these physical attributes, Alexander may have also boasted of pleasant body odor – as is clearly mentioned in Plutarch’s “Lives of the Noble Greeks and Romans,” written 400 years after Alexander’s death.